Color coding is not automatic. There is no way for RootsFinder to know which kits match to whom in your tree. Color coding is created when you match a kit to your tree. See Kit View help page. When you click on a node the kit appears in the Kit View in the right side bar. 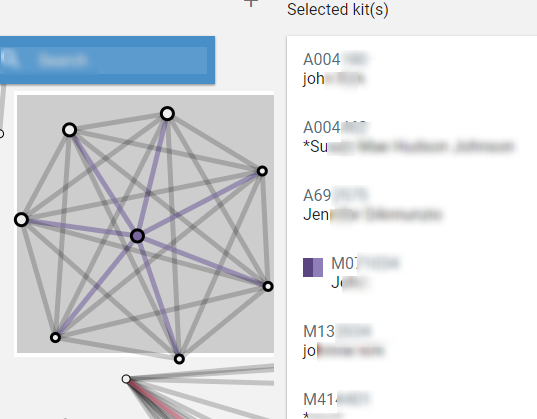 If you would like to analyse several kits at once, control-click on the nodes you wish to see. Each node will be marked with a black circle and appear tin the Kit View. 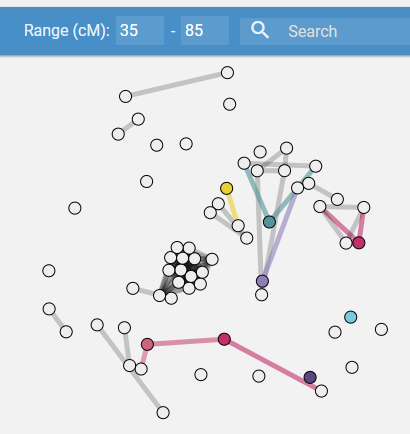 If you would like to analyse entire cluster, press the shift key and left mouse button and drag over the cluster. All the kits in the marked area will appear in the Kit View. 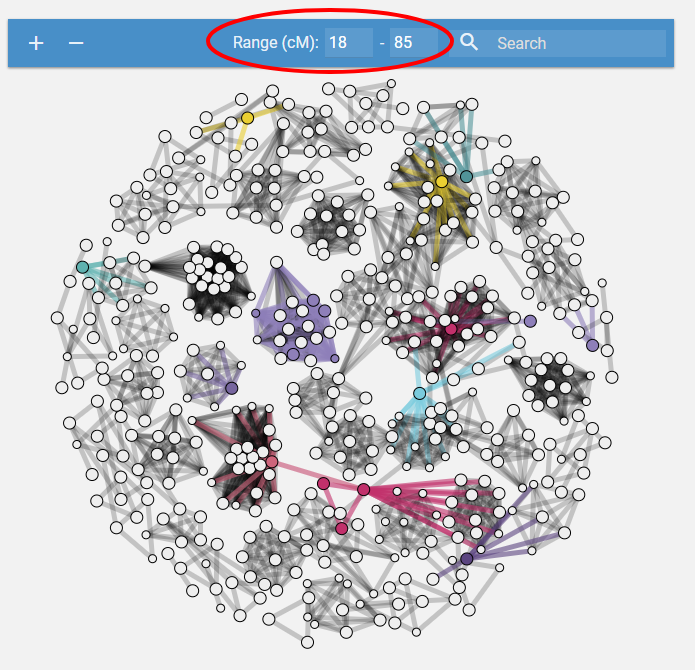 When you look at the Triangulation View, you see circles connected by lines. Each node represents a kit that matches segment(s) in your DNA. 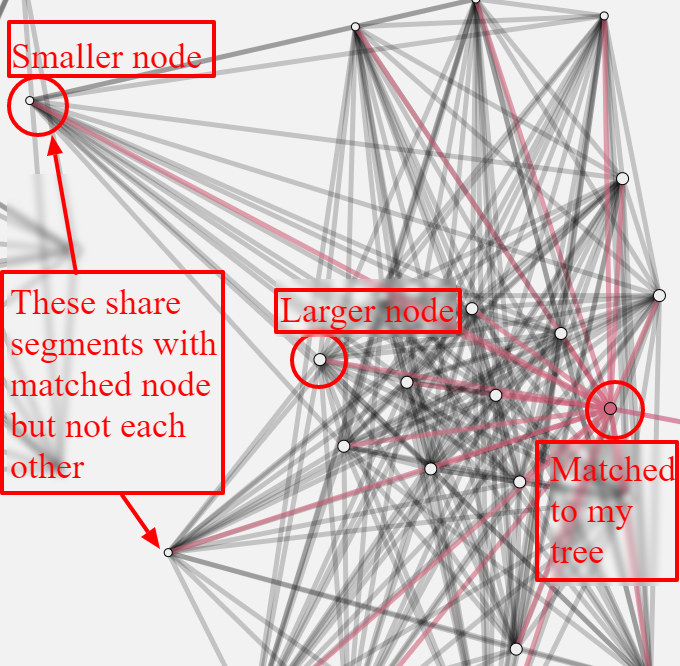 The size of the nodes varies with the amount of shared segments. The lines tell you which kits share segments with each other. When a kit is matched to your tree, its node is color coded for that branch of your tree. The lines connecting that matched kit to other kits are also colored. In this illustration, that one kit has been matched to the tree and is pink. Pink represents the maternal maternal line. The pink lines connect the matched kit to matched and unmatched kits that share segment(s). The black lines connect unmatched kits to other unmatched kits that share segment(s). 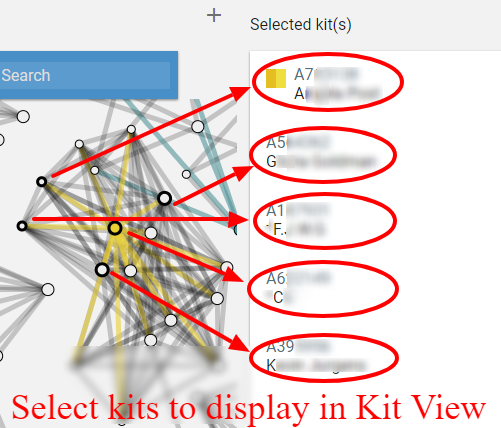 Note that several kits share segment(s) with other kits but not with each other. It is not unusual for one descendant to inherit certain segment(s) from progenitor and another descendant to inherit different segment(s). However, finding kits that match other kits but don't match each other may suggest a differentiation between maternal maternal and maternal paternal lines. The Triangulation View defaults to displaying kits that share segments between 18 CM and 85 CM. The CM range is displayed at the top of the Triangulation View. However, there are times when you may want to limit your view to the kits that are the most closely related to you. Or, when you only want to analyse distant relatives. 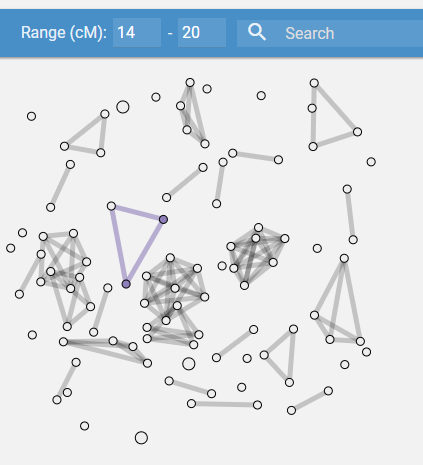 You control the CM range by entering you choice in the range fields at the top of the Triangulation View. Enter the name of the kit owner or kit number in the search field at the top of the Triangulation View. The kit will pulse.